Patrizia Merendi born in Bologna in 1954, she graduated from High school after studying Art and then from the Academy of Fine Arts in the same town. Initially she dedicated herself to teaching and researching painting and graphics at the same time. Later she experimented with various techniques and expressive modes such as: oil painting, water colour, and a mixture of other techniques. Ultimately she prefers pastels because of their soft pigmentation and mood of colour. 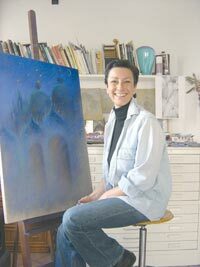 In 1997 Patrizia Merendi left teaching to dedicate herself completely to her personal search for symbolic expression. In 1999 she experimented a new and different kind of sculpturing with melting glass in big dimensions. During the last decade she has overseen innovative projects regarding the improvement of Arts in places of worship through the installation of window walls that were made using different techniques such as glass fusion and grisailles painting.